I admit that over the past few weeks the US stock market has been a little bullish and has put on some good short term gains. I however have not been excited by what I have been seeing. The press however seem to be exactly the opposite. We’ve seen headlines like Dow Closes at 5-year high, Market milestone: Stocks return to late 2007 level and even the US version of The Motley Fool telling us How the Dow reached a 5-year high. It really is unfortunate that we live in an era where not even the press feel the need to report facts and can get away with such sloppy journalism. Firstly, in nominal terms the Dow Jones Industrial Average (DJIA) has not reached a 5 year high. According to Google Finance within the last 5 years in nominal terms the best DJIA close we have seen has been 14,164 on the 09 October 2007. In comparison in this recent bull market the best close we have seen has been 13,596 on the 20 September 2012. I make that a gap of 4.0% so not what I would call a high. 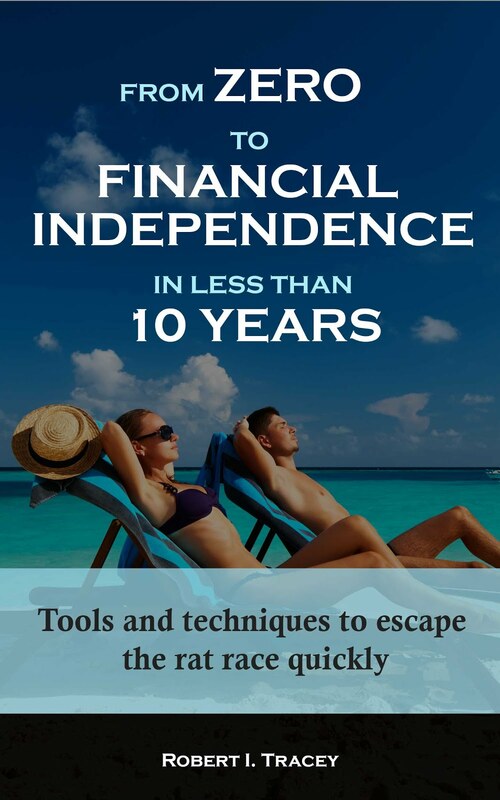 The full 5 year story can be seen in my first chart which comes from Yahoo Finance. I personally don’t follow the DJIA as I believe there is more to the US market than 30 stocks. My preferred index is the S&P 500 and it’s not telling us anything different – we are not at 5 year nominal highs. Within the last 5 years the best nominal close has been 1,565 on the 09 October 2007 compared with 1,465 on the 14 September 2012 for a gap of 6.4%. Again the full 5 year story is shown below. In my opinion all of this reporting of nominal prices is just meaningless. I’ve now come to expect it from the mainstream media but I didn’t think the Motley Fool would also get in on the act. The problem is that the reference point they are measuring the indices against, the US Dollar, is not a stable reference point as it is constantly being devalued by inflation. 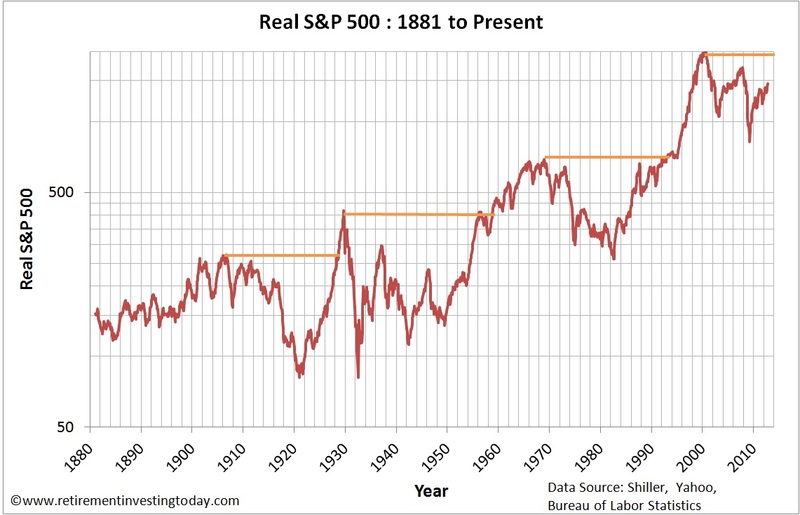 If I correct for this devaluation we end up with a Real S&P 500 Price Chart which I show below. We are 26.7% off the real last stock market high last seen in August 2000. In other words we are still in a long term bear market which is more than 12 years old. My datasets for the US now go back to 1881 and within this data I can only find 3 other periods over that history where we have seen conditions as bad as this. These are shown in the chart below. I call these the historic severe bear markets and this is my regular update of this metric. They are defined as periods in time where from the stock market upon reaching a new high then proceeded to lose in excess of 60% of its real (inflation adjusted) value. So what were these other bear markets? The first severe stock bear market (marked in purple on the chart) started with a new real (inflation adjusted) high being reached in September 1906. Following this high the market then began declining with the period incorporating the 1907 Bankers Panic which was caused by banks retracting market liquidity and depositors losing confidence in the banks. This all sounds quite familiar to what we are seeing today. This occurred during a recession and there were a number of runs on banks and trust companies. Additionally, many state and local banks went bankrupt. 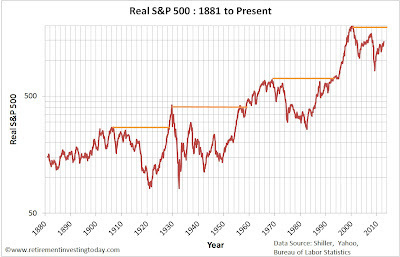 From the high it took until January 1920 for the stock market to break through the 60% real loss barrier (a real loss of 60.9%) and then until December 1920 to reach its real low of -70.0%. That’s 171 months a period of 14 years and 3 months. The market then didn’t reach a new real high until September 1928, which is exactly 22 years, at which point it was rising at a rate of 25% year on year. Unfortunately though, the market had less than 2 more years of positive real returns in it before hitting the next severe stock bear market. This second severe stock bear (marked in blue on the chart) market started with a new real high being reached in September 1929. This is the beginnings of the well known period of the Great Depression. I won’t go into the history here as I’m sure it’s well known by all readers. What is interesting however is that the US stock market passed through the -60% mark on a number of occasions. From the high it took until January 1931 for the stock market to reach a real loss below the magic 60% mark at -62.0% and then until June 1932 to reach its real low of -80.6%. The rate of decline was much faster than severe stock bear market one at 33 months. However at this point the market never really recovered and dipped back below the real -60% mark in January 1933, July 1934, April 1938, June 1940, February 1941 and was back at -73.1% in May 1942. That’s a period of 152 months or 12 years and 8 months. Even 20 years later the market was still below the real -60% mark. 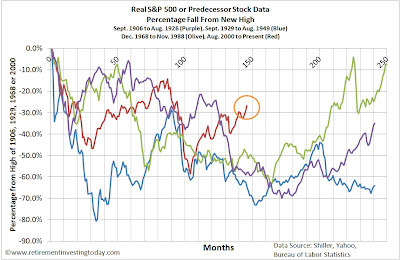 This bear market didn’t actually reach a new high until November 1958 which is a period of more than 29 years. Again at this point the market was on a steep ascent rising at a rate of 27% year on year. The third severe stock bear (marked in olive on the chart) market started with a new real high being reached in December 1968. This period incorporated the stock market crash of 1973 to 1974 which came after the collapse of the Bretton Woods system and also incorporated the 1973 Oil Crisis. So from the high it took until March 1982 for the stock market to reach a real loss of -60.9% and then until July 1982 to reach its real low of -62.6%. That’s a period of 13 years and 7 months. A new high wasn’t reached until December 1992 which is a period of 24 years. So that brings me back to today’s market which I show as the last line on the chart, marked in red, showing the bear market we have been in since August 2000. It started with the Dot Com Crash however we were unable to reach a new real high before the Global Financial Crisis took hold and we entered what is now being called the Great Recession. I first started discussing this period back in January 2010 and in that time we still haven’t recovered. The sliver of good news is that I can’t yet call this period a severe stock bear market as we ‘only’ reached -58.6% in March 2009. The bad news is that we are only 145 months into this one, which if history is any guide, leaves us plenty of time yet to see a severe stock bear market. What will cause it? There are many possibilities including Quantitative Easing leading to big inflation or one of the PIIGS going bankrupt. As always, I don’t claim to have any idea. All I know is history suggests there is still plenty of time for it to occur. Inflation data from the Bureau of Labor Statistics. September 2012 inflation is extrapolated. 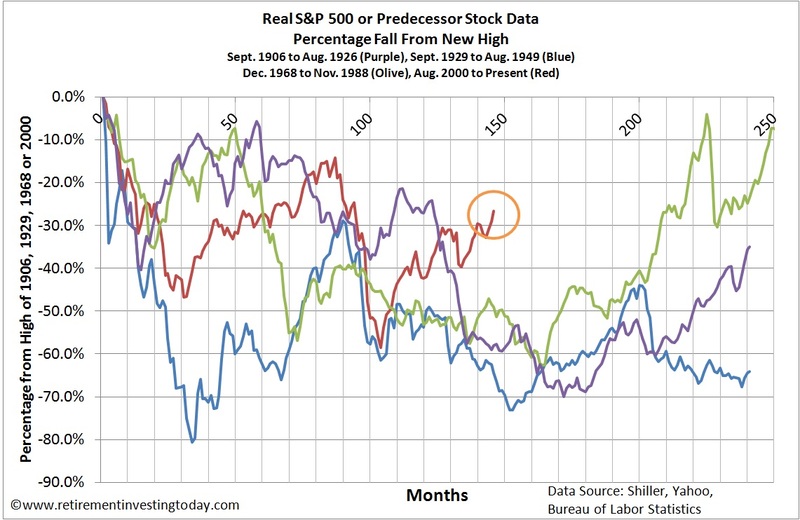 Prices are month averages except September 2012 which is the S&P 500 closing price on the 21 September 2012. A timely reminder that plenty can still go wrong: China hard landing, Grexit, US fiscal cliff, Israel/Iran. . . I still intend to keep plenty of cash and mostly sit on my hands at current market levels. Excellent post. A good bit of historical perspective never goes amiss, especially given the absurdly short term perspective through which the media tends to see and report on the markets. It's clear that there is significant downside potential to the equity markets from current levels - Salis Grano sums up well the possible developments that might cause markets to take a tumble. I've no idea which (if any) it will be, but it's easy to see plenty of reasons for short/medium term underperformance. I read an interesting view from Prem Watsa, the head of Fairfax Financial, this week. His view is that on the short/medium term, the risks in the equity markets are very much to the downside. But on the medium/long term, the opposite is true. I don't adopt trading strategies, so will probably simply continue to accumulate good quality assets at fair or (hopefully) cheap prices, by buying index funds/OEICs that keep costs to a minimum. I can well see the logic behind sitting on cash or adopting trading strategies to hedge against (or bet on?!) a market fall, but that's not my game. I tried trading and very quickly realised all I was going to do was lose money quickly. 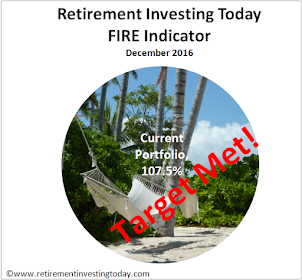 I'm working on a post which fully describes my current investing strategy. I do tactically allocate to Equities (it sounds like I sit somewhere between you and SG) based on PE10 values. It's a fully mechanical non-emotional system and the tilt is proportional over or under PE10 valuations. It's quite a long post so will probably take me until the weekend to get live.